"Very straightforward, honest, and they do good work." I loved the service. I would certainly be there in the future too. My most recent service was a battery check and for a state inspection. I dropped off the SUV, and someone from Restas took me home. Once the check and inspection were complete, someone from Restas called to tell me it was ready. Everything went well. In fact, they explained to me that the message given to me by my vehicle's database was that the battery for my key needed to be replaced, not the vehicle battery. The local hardware store carried the key battery that I needed. The staff is always accommodating and friendly. Will continue to service my auto there being a satisfied regular customer. Good troubleshooters, always explain the reason work needs completion, always complete work in a timely manner. Everyone was professional and courteous! Very thorough with repair and friendly. Excellent service, car was repaired in the time frame I was given. Very nice, I really liked that they talked to me about what the problem was, and what they did. Great people great work for a fair price. John, took a quick ride, diagnosed the problem and made arrangements to get the repairs done. This repair job required Resta's to replace the radiator in my 17 year old RAV-4. It's done, and the vehicle is running well. 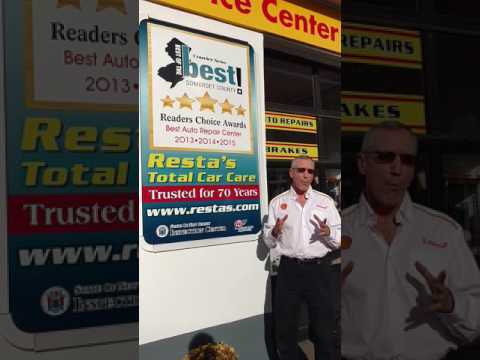 Restas Car Care was established way back in 1946, this family-owned business has been providing quality auto repairs for Somerset and the surrounding area ever since. This RepairPal Certified shop features a very experienced, well trained, and ASE certified team who are equipped with the state of the art tools and diagnostic equipment necessary to service and repair today's modern vehicles. Repairs performed here can range from minor and major mechanical repairs, to check engine light and computer diagnosis and repairs, to tires and wheel alignment, to state smog and safety inspections, as well as your scheduled maintenance needs. All this work is backed by a 24-month / 24,000-mile warranty for your peace of mind. Our survey of their recent customers revealed a group who enthusiastically describe the team here as: “friendly”, “professional”, “knowledgeable”, “honest”, and "reliable". A local shuttle service, rental & loaner cars, early bird drop-off, and a waiting area with wireless Internet are also available for your convenience. Open every other Saturday from 9am - 1pm.